Is Goldman Really That Good? Goldman Sachs released its quarterly earnings yesterday, and the headline was net income of $1.8 billion, doubling analysts’ estimates. I would say this is definitely good news for Goldman; whether it’s good news for the banking sector as a whole is more uncertain. First, as Bruce Wayne, one of our readers, pointed out, the quarter-over-quarter comparisons left out December. Because Goldman just changed its fiscal year end, its previous quarter ended in November and its latest quarter ended in March. December was reported separately and – surprise, surprise – Goldman took a net loss of $0.8 billion. So if they had mashed December into Q1, they would have had a four-month “quarter” with $1.0 billion in profits. Second, the positive results probably reflect a better mix of businesses than other banks enjoy. Although Goldman has made big one-sided bets, its trading operation traditionally hedged many of its positions and made a lot of its money on volume. Its positive Q1 results were largely due to strong performance in fixed income, currencies, and commodities (FICC) trading, which reflects the fact that Q1 was a busy quarter – in part because of the massive unwind at AIG – and, as Goldman’s CFO politely said, “Many of our traditional competitors have retreated from the marketplace.” With fewer players in town, the oligopoly profits go up – another reason why the big banks are even more powerful than they were before the crisis. When it comes to the value of its own investments, Goldman seems to have done less well. Its net revenues for principal investments, mainly “Other corporate and real estate gains and losses,” were negative $1.4 billion in Q1 and negative $0.8 billion in December. While Goldman was able to more than offset this with trading gains, I wonder what the implication is for commercial banks that are not dominant players in trading. This entry was posted in Commentary and tagged banks, goldman sachs. Bookmark the permalink. Goldman sets aside about 5bn for comp, more than 2.5 times Net, about 50% of Gross, for 10% less people than last year, during an ongoing crisis of epic historical proportions, while using its most favorable position in trading to manipulate the markets and dictate the government’s every policy move and you are ok with it? What would they have to do to bug you, drop the pretense and just release a statement explicitly announcing that the republic is now a wholly owned subsidiary of GS? Or, mark to market accounting requirements don’t apply. Most companies have comps greater than nets (comp is an expense, and if labor is your #1 expense it tends to be greater than net). This doesn’t directly mean much, especially since variable comp is heavy in this sector. (Now, one can argue that the Fed has the right to require that the comp structure be changed to avoid risk-encouraging one-sided bets, especially if GS is going to be covered by an implicit guarantee. Now, combine this with the fact that the big O has acquired a purebred puppy from the same breeder that services the Kennedy clan (after promising to get a rescue pup). Where is the Change, man? Where is the Change? Is Goldman Sachs manipulating the stock market? Crackpot stuff, probably, but it is a little odd when the top firm is responsible for so much volume. So Goldman received $13 billion from the government via AIG, issued (and is continuing to issue) tens of billions in FDIC-insured debt, and has access to all of the Fed’s ultra-low-interest liquidity facilities… But if they just repay $10 billion to the TARP, they will get out from under any Congressional interest in (e.g.) their compensation setup. And that is precisely what they intend to do. What a country. Which reminds me, under what law does FDIC have the authority to insure anything other than deposits? Oh never mind. Well he’s done some nice re-arraigning of deck chairs, and he got some applause on the international scene, so thats something! Why aren’t Goldman’s existing shareholders (including Buffett) up in arms about the idea of issuing stock to buy out the government? 5. …with money that could otherwise flow to you directly via dividends or indirectly via an increased share price due to a stronger bottom line. Consider me stupid, but why does GS have us by the b*lls like this? Am I to believe that they own every politician and policy maker on the planet? What can the American people collectively do that will be the equivalent of a shot across the bough and put the fear of God into these criminals? Bank runs? A national strike? And who is our organizer. . ? The fact that they are confident or raising this money is certainly heartening. Good to know that private money is willing to come back to the markets, even if it is in GS. Take all of your money out of the banking system, both shadow and FDIC regulated. Pay off all of your debts. live within your means. Plant a garden, learn how to live sustainable way. This makes sense, but goes against every cell of logic in my body because there is no justice whatsoever in this strategy. The term sheet for the TARP specifically allows the money to be repaid if the recipient performs a private Tier 1 capital raise of sufficient size. Buffett’s terms come with no such provision. So GS cannot pay back his investment for 3 years (or maybe 5; I forget), even if they want to. They need that compensation to “attract and retain top talent”, of course. After all, these are the smartest people in the world; you cannot hire them for a mere six or seven figures. When pirates hijack a ship, the least costly way to resolve the situation is simply to pay the ransom. For the life of me, I cannot imagine why anybody would ever suggest any other course of action. au contraire: take all your money out of everything and get long GS — they are working every angle to perfection: Hank Paulson got them 100 cents on the dollar from taxpayers using AIG as a conduit; ISDA now allows them to now close out AIG contracts (et al, of course) off market, which amounts to yet another grant from the government; they’ve got their alums ensconced in Treasury, the Fed and, most importantly, the NY Fed, so they get the early warning on policy shifts and, more importantly, they get to influence policy to a degree no other firm can imagine; and no one in the media, Congress, or, to all appearances, the federal government is all the wiser. Let’s all check back a year from now and see who’s the best-positions of the former investment banks in America. And let’s see who’s the biggest beneficiary of the constantly changing legal and regulatory framework that evolves over the next year. Not since the days of Marcus Licinius Crassus has the world seen a more adept manipulator of government and policy as we are witnessing at Goldman. Its modern incarnation started with Robert Rubin and has continued to evolve beautifully with every twist and turn of policy and administration to date. There is no reason to expect anything will change. In fact, given its development and maturity, it can only get better. besides, if the govt forces a breakup of GS due to glass-steagal type distinctions, that may be very good for equity holders ultimately. We’ll continue to see the government picking the “winners” and “losers” instead of the market. Unfortunately the price we’ll all have to pay for the bailouts and stimuli is a defunct currency. Perhaps the cost of paying the ransom on the first ship seems like the “least costly alternative”, but you’ve now created an incentive for pirates. They know you’ll pay the ransom and thus will continue to hijack ships at an ever increasing rate until eventually it is no longer “the least costly way to resolve the situation”. You shouldn’t incentives for more piracy. This seems fairly obvious no? I prefer the special forces strategy. Three shots, three kills. Pirates are disincentivized. Seas become safe to travel again. I know, Nemo, I just wanted to type “three shots, three kills”. I’m pretty certain virtual revenge is all we got. Pingback: Goldman results are, umm, fishy. Check for insider trading on this one! « Stocks Go Up. Stocks Go Down. I applauded GS when it clawed back 48% of 2008Q4’s negative net revenues from their comp pool and kept full year 2008 comp at 48% of net revenues. Every other bank blew through their historical comp/net revenue ratios last year. Now it looks like GS have decided to join the crowd and abandon their historical ratios. As Brian pointed out, they’re reserving 50% of the 2009Q1 net revenues for comp. However, he didn’t mention, and GS declined to highlight, that they’re reserving over 400% of the stub month (December) net revenues for comp ($744MM comp on $183 net revenues). Taking the four months together, GS are reserving $5.4BN in comp on $9.6BN net revenues, or 57%. The question wasn’t what should I do to make a lot of money, the question was what can we do to put an end to this. Oh and your fawning admiration of the whole thing is repulsive. Lower short-term interest rates are good for trading. I would suggest the following Beatles lyric is appropriate for your question: “LIFE is what happens, when your busy making plans”. Don’t do anything Donailin. Wait until your government has completely looted the treasury to the benefit of the financiers of America, and then try to explain it all to your grandkids when the time comes. That’s what scared people do….run, and hide. You ALL know whats going on, but you do NOTHING of any value to stop the looting. You deserve whats coming. Dude, lighten up. I was being facetious. Surely even you can appreciate that sort of thing. This is not on topic, sorry, but you may have noticed today the press release by the DHS. TV news is reporting on this it too. I noticed one of my fellow bloggers mentioned something about veterans not being afraid to stand up for their rights and now today, veterans are on the list as possible threats as reported by homeland security. Honestly, it is easy to get paranoid, two days after you have a veteran blogging and suddenly veterans are on “the list by DHS” and your blog and all of your bloggers may be on the list too…. I just thought you might have something to say about this. Jas Jain. . . ? Recently, Mark Patterson got a new job. His old job was as the head lobbyist for Goldman Sachs, and he was based in Washington, DC. His job, was to convince the US politicians to give Goldman Sachs preferential treatment, and pass legislation that is favorable to Goldman Sachs. He did that job very successfully, for many years, and I am sure he made a fortune for his efforts. He’s not doing that for a living anymore. He has a new job now. Mark Patterson recently accepted a position at the U.S. Treasury Department. He is Timmy “The Tax Man” Geithner’s new Chief Of Staff. And all of you gripe at me, when I tell you that your country is DEEPLY corrupt? Didn’t Obama come on US television one day a few months ago and say that NO lobbyists would be working in high places in his administration? When are you going to learn, that the “real” enemy isn’t in a desert in asia….the real enemy is in Washington. You have met the enemy, and they are you. Net income for the quarter: 1.4 billion. Seems like a pretty transparent pump-and-dump to me, but what do I know? Thank you for reminding us of the obvious…I would be curious to know from which country you are from, and how does it deal with corruption. We need to starve the beast (the federal government), it is the only way to end the corruption. If the Feds don’t control they money they don’t have power and very little corruption can exist. Of course Goldman is doing well. After years of extraordinary profit using investment tools that took our economy to the point of collapse, Hank Paulson, one of their own, was essentially funneling money into their coffers – through the front and back doors. Hank Paulson also decided not to funnel cash to one of their competitors – Lehman – which, conveniently for Goldman, collapsed. They’ve got accountants who changed their fiscal year just now to shave off a bad month from the quarter. If they can’t succeed in that pool, then what gives? I knew the entire system was corrupt beyond measure, but when I read the details, it blows my mind, really. Why anyone would put their money in any market is beyond me. I never have and I never will. Christ, it’s a completely rigged game. This makes Madoff look like Mother Theresa. I almost wish I didn’t read it. It’s really easy for Goldman to do well when they have received loads of money from the AIG debacle. From the taxpayers to the Goldman Sachs balance sheets. Brian, can you translate that article to a human readable form? I tried to read it but all I got is the conclusion that we are looking at more volatility (big deal). All of this whining and moaning about GS and other i-banks seems a little short-sighted and “pitchfork-esque” to me. Sure, the last 10 years or so have been marked by an increase in systemic risk to the point of making headlines, and there are obvious problems that need to be dealth with. But everyone forgets that GS, LEH, BS, ML, MS, and a graveyard filled with smaller firms (Salomon, Paine Webber, etc. etc.) all operated very successfully for the better part of the 20th century and no one complained. And, for better or worse, their place within the economy (allocating capital to productive enterprise), proved very lucrative, but rightfully so, as they helped fuel much of the progress of the last 100 years. However, the system worked because there was no principle-agent problem (they were all partnerships), and they bore their downside risk. So if a partnership such as GS wanted to make big one-way bets with its own money it should be free to, and should be paid for taking on that risk. The real problem has arisen when these firms can shunt the downside to others (shareholders, taxpayers), while retaining the upside. Now, as the agents are no longer the principles, they don’t bear the downside and only participate in the upside. The ONLY way to fix this problem, is for the government to allow firms to go bust. In the 1940s-1990s, this was never a problem, because any single firm never threatened the stability of the system. Unfortunately now, Team Obama has to make the choice between employment and capitalism, and they have chosen employment. As much as bankers can be chastised for their greed, for the most part they never did anything illegal. And the question as to whether they should have acted as irresponsibly with leverage as they did, can be answered with a simple illustration of game theory. Most of you are familiar with the prisoner’s dilemma: two prisoner’s are better off if they both keep quiet, but they both screw themselves over by implicating the other. Unfortunately, the optimal solution for each individual is to screw the other and thus screw themselves. In banking, while the system as a whole would have been safer if there was less consolidation and less leverage, individually, each bank had incentives to go on buying sprees and leverage themselves to the hilt. You can’t expect profit maximisers to operate in any other way. Of course, the logical conclusion is that its up to the government to help sort out this externality. The problem is, that as much as “Wall Street” got drunk with money, politicians got completely hammered. All of a sudden, once Greenspan came on board, it became so politically unpalatable to have a recession, that the gov’t “bailed out” the entire economy with the famous Greenspan/Bernanke Put of lowering interest rates. THAT’s your government guarantee of the banking system. Everytime the economy took a turn for the worse, our government was so scared of living through a recession (or having to get re-elected through a recession), we looked to the central bank to lower rates and to congress to cut taxes. The “great moderation,” as much as it was a function of globalisation and a more sophisticated banking system, was also a result of increasing short-sightedness by politicians. We assumed that we could legislate our way out of every economic downturn, without realizing that the creative destruction that comes with recessions is healthy, and the bankruptcies that arise are necessary. Capital is not allocated efficiently if the government is their to become the savior of the economy at every downturn. Instead what happens is that too much capital flows into that industry which has benefitted the most from the “put,” ie finance. So everytime this blog lambasts bankers for greed and incompetence, I would implore the economists here to realize that they are 1) not breaking any rules, and 2) acting as any rational (profit-maximizing) human being would act given the rules of the game as they are. Bankers have been greedy for thousands of years, and if the rules are structured correctly, capitalism can channel that greed into being useful for the rest of the economy. It is only when our government gets involved for the wrong reasons, that we all suffer the consequences that we do. The vast majority of equity market liquidity is provided by a small group of high frequency traders. The market depends on that liquidity for efficiency, the vanilla money gets better price discovery and cheaper trade executions, the liquidity providers get paid for the service. As volumes decline, it gets much easier for one large well connected participant (GS) to manipulate prices in the short term. Basically what those charts show is all the other big liquidity providers sitting on the sidelines, leaving GS all alone. Big directional moves on declining volume screams of manipulation and is the type of situation when we usually see black swans emerge. Think summer 2007 or Fall 2008. Big increases in volatility are a big deal because it says the market is not efficient, and participants are scared and confused – like a stampeding herd of animals, bad things happen. Just because something is legal doesn’t make it moral. You assume because things are a certain way that is the natural and correct state of affairs, then using that assumption to justify the most outrageous nonsense. The problem isn’t that we had a few rouge actors breaking the rules, the problem is that we allowed the entire financial system to grow so large and powerful it ate the economy. The tail has been wagging the dog for 30 years, now we are reaping the consequences. Call me cynical – but I dont think we should be constructing our society on the premise that everyone should try to be moral. I would rather operate on the assumption that everyone is greedy…and try and structure the rules such that the greed is channeled toward productive and fair enterprise. Usually, if a firm releases misleading info, there is an investigation–i guess it is one more example of the Goldman bunch knowing that they have immunity on all legal issues. Yes, people talk of TARP and not of the bank holding company status or TLGP debt. Pay back the TLGP debt and stop pretending to be a bank and that will gain some street cred! Fr. Frankie replied to my question with a couple of great articles on James’ April 10 post ” Stock Market Rally: NYT.com discussion” . But the way that i deduced that market manipulation was going on is that i watch the DOW components all day long and take a quick and dirty analysis of these components matching the DOW price action–it hasn’t matched at all during this rally…so it made me believe that the FED’s ability to use “monitary policy” may be happening in the futures market via all the primary dealers and possibly through purchases by the 12 private federal reserve banks–12-20 trillion pushed into the system through the private federal reserve system is plenty to trade to move the market in any direction the fed chooses to give the desired effect to make the believers out their think that stimulus and monitary policy have fixed the problem of an economic downturn…i just feel worse because the disease that created the downturn were fed (pun is intended) instead of cured by the process of elimination. If my observation is true, and it becomes more apparent that this market manipulation is what is moving the market, i am sure more cleaver means will start happening, like outright purchases of DOW components….with the power at the hand of our private federal reserve system, anything is possible. Has anyone calculated how much all of Goldman’s affiliates received through the AIG bonanza? When you look at the events in total, it is all very disturbing—lehman denied a bridge loan, aig being kept alive with money passed through, instead of receivership, MS and GS getting bank holding status, then finally, the infusion of tarp the weekend following TARP 1 passage makes me feel completely duped by any words from the fed or treas…and all of our elected officials although maybe a few are not shills for the private fed reserve system and the toobigtofail banks. I meant Dr. Frankie not Fr. Frankie, sorry. Your last paragraph, although it may be true to the extent that there has been no official and legal examination of the events that took place in the fall…until the actions starting in the fall by our government represented by the fed and the treasuries are examined, there will be no peace for all of us.–Starting with the denial of Lehman a 6 billion dollar bridge loan, to the two day’s later giving AIG an 85 billion dollar loan, and now 185 billion that will likely never be seen again, and the long lobby for TARP when clearly MS and GS were preparing for a cash infusion by turning almost overnight into bank holding companies….. It may have been legal for the government to take the actions it did in the fall–but it may also EASILY be viewed as self dealing since the fed is a private system acting on behalf of the treasury. This isn’t the first time in history when governments have been suspected of corruption. There is no way that our country will ever get confidence back until there is a proper, independent investigation of the issues involved. The Congressional Oversight Panel has made loud statements about the whole matter, but unless a truly independent legal investigation occurrs, i doubt that any press releases or nice talk can change the hearts and minds of the country. People may keep on keeping on, but they won’t forget. that’s what they tell themselves when trying to sleep at night, I suppose. In addition to all the effective letter writing you can do, if you are motivated, you might contact some of the socially conscious investor groups and put forth your beliefs as to why some of the bank shares might need to be on their “do not buy” list. Tea Party participation is a no brainer, and most obvious, . …the rest is still a story in the making. Perhaps Jas Jain. But is everyone in that boat? I hope not. I would like to think that there is a solution, and the solution is LIVING WITHIN ONES MEANS. A good concept, no? I agree with Donailin. After reading your post Dan, it makes me want to forget i read it…talk about real terrorism…sounds like Martin Armstrong is a surviving victim of terrorism by the bank cartel that is being exposed on this blog…yet this article is the first time that there has been a mention of even the justice department being involved. Ok, i am officially terrorized….and i am not even curious anymore. In short, you are saying that everyone acted “within the existing rules”, correct? I guess my question is: “within who’s rules”? My question is very plain. Is it “OK” to deceive people OUTSIDE of your country’s borders with your financial nonsense, and then claim “well, it’s OK, because these are “our” rules”? There are many of us OUTSIDE the US that got hammered here, because of the financial corruption that happened inside the borders of America. We invested in your fraudulent products, we “enjoyed” NONE of the upside, yet now feel that we have been robbed. And you seem to want to simply write this off to a misunderstanding of motivations. Bullitin Mr. Coffee: I am not from America, I invested in your mortgage fraud, I reaped NONE of the rewards, and it cleaned out my pension plan for a fortune. We believed your ratings agencies lies….won’t do that ever again. Oligopoly profits are now politely called “improvements in the competitive situation”. If you read my post, you’ll see that my defense of the system does not extend to the government. My belief is that the system failed primarily and fundamentally because of the failure of government. 1) “home ownership” has been touted as some vague social goal for the last 50 years, and has thus been effectively subsidized by the government. Mortgage interest shouldn’t be tax deductible. Fannie Mae and Freddie Mac should have never been created. In 2004 Democrats PUSHED FOR LAX LENDING STANDARDS for mortgages in order to increase low-income home ownership. 2) Government failed to understand that continued consolidation of the banking sector was an anti-trust issue far beyond the scale of the puppet show that Microsoft was put through. 3) Politicians have not lived through a “real” recession since the early 90s, and haven’t had a meaningful one since the early 80s. Instead of the relatively steady business cycles of the 40s to the 80s (5-7 year bull markets, 2-3 year recessions), an entire generation of politicians has grown up over the last 30 years with few economic downturns to legislate around. Hence, rather than realizing that recessions are a necessary and healthy part of the capitalist deal, government works itself into a flurry of activity trying to do everything to prevent even the smallest uptick in either unemployment or inflation. The most direct beneficiaries of this are the financial institutions, whose livlihoods are probably most closely correlated with the business cycle. 4) Fastforwarding to Fall 2008, the crisis reached apocolyptic proportions PRIMARILY because the government had too much power and the rules were changed on a daily basis on the whims of individuals. The hypothesis that the market was prepared for a Lehman bankruptcy was flawed – just look at the bond prices. The friday before bankruptcy, the bonds were being lifted at 87cents. The government bailed out Bear, and just nationalized Fannie and Freddie…the market was prepared for another bailout. Paulson changed the rules that weekend, and the market went into chaos. Realizing his mistake, he bailed out AIG and the rest of the financial sector. Now, they are changing course again, and the next financial institution to reach crisis levels, will probably see creditors take a hit. This constant changing of the rules is what is undermining the ultimate recovery of the system. The thesis of my post is that anger should not be placed upon bankers, as they, like any rational actor within an economy, are acting in their best interest as long as it is legal. If you believe in capitalism, you can ask no more of any citizen. It is up to the government to help sort out any externalities within the system. Unfortunately, far from plugging these externalities, our government created more. By promoting low-income home ownership, our government incentivized banks to fill their balance sheet with toxic loans. 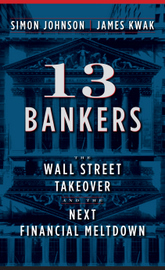 By “bailing out” the economy during every recession over the last 30 years, the government incentivized risk managers (investors, traders, entrepreneurs, the caretakers of the world’s capital) to leverage the upside, because they knew that Greenspan/Bernanke would come riding to their rescue with their now infamous “put.” And by failing to prosecute against the true monopolies that were being formed, our government allowed institutions to become “too big to fail,” thus giving bankers the free reign to operate without regard to the downside. The solution isn’t an outcry against bankers and their greed. The solution is an outcry against a government that is too weak to let institutions fail, and too weak to uphold true capitalism. I agree with your last statement, and your argument is reasonable, but I still think you are leaving out alot about accountability of people. Sarbanes-Oxley is supposed to hold accountable the CFO and CEO’s of companies to the truth of thier company’s financial statements. But ever since this crisis, you hear alot of characters acting like they had no idea what was going on…i think shareholders to the “too big to fail” are also weak because to do what they need to do, it would cause great disruption in their companies,so they choose silence as the easy route…it is all very shameful. And one more thing, if all of the bankers behaved the way they did because they knew they would get bailed out, does that make them any less accountable personally for allowing the wildly excessive leverage and the packaging and sale of what looks to be fraudulently conveyed products? If you think that is acceptable, and that is the truth of a few of the too big to fail, anyone caring about right and wrong probably wouldn’t want to do business with this bunch ever again. Is GS profitability directly related to the Fed’s “asset purchase” program? Several weeks ago the Fed announced that it was engaging in a program to purchase several billion dollars worth of derivatives (“asset backed securities”, mortgages, consumer loans, student loans, etc.) in order stimulate demand for the securities in an attempt to “unthaw” the credit markets. Is GS better-than-expected performance directly related to the Fed’s purchase program? Spoken by a true success, I’m sure. It amazes me how many people discount the human intelligence and drive factor at GS. The fact is Goldman has and is able to retain the smartest people on Wall Street. It’s very easy to dismiss this from the outside looking in, of course. But it’s hyperbole – let’s stick to facts. Coffee Boy – finally a relatively sensible post on this board. Brian, go back to the farm. Yours is a well-argued summary of the classic reply to the “greed and incompetence” position taken by people who are not inside the markets. It’s the financial market analog to inside baseball. In such an argument, bankers are, at best, amoral: If something is not illegal, per se, then it’s not proscribed. So, as long as no rules, regulations or laws are broken, bankers are free to “maximize profits.” Banks therefore have an incentive, naturally, to hire persons intimately familiar with the law — so as to navigate right to the very edge of legality — who know, to a reasonable degree of certitude, how hard they can push. When the system breaks down, it’s not that the bankers’ have caused any harm — they’re just following the rules, laws, and regs they’ve been handed and must observe. When things go off the tracks then, it’s merely a case of inappropriate or weak regulation. Or, as you summarized, greed wasn’t channeled into something useful to the economy, but that’s not the fault of the bankers. This line of reasoning, which is trotted out in every instance of market failure, misses a key point: The reason for the market failure is the ceaseless working over of “controlling authority” (to borrow that well-turned phrase) that delimits what constitutes legally acceptable behaviour. This ultimately is a subversion of the Rule of Law, which as F.A. Hayek points out, relies on the legal and regulatory system being disinterested if it is to be effective. So regulation cannot be effective because it is always morphing into something that benefits whoever has been successful in changing (one could say bending) laws and regulations to benefit their particular interest. In this case the bankers. Specifically, the former investment bankers. Just as a case in point, it is worthwhile to follow the line that begins with Hank Paulson lobbying the SEC to change the rules for calculating net capital laid out in his prepared testimony in the year 2000 as GS’s CEO ( http://banking.senate.gov/00_02hrg/022900/paulson.htm), thru to the adoption of rule changes that essentially allowed the former investment banks to not only lever themselves massively, but to also define their asset base to their regulator, the SEC. (http://www.sec.gov/rules/final/34-49830.htm). When this super-charged cycle of balance-sheet transmorgification reached its logical conclusion, these former investment banks no longer were recognizable as financial institutions per se. They no longer were able to fund in the short-term credit markets as before, and therefore had to run to the US government, restate their charters to become “Banks,” and go on the dole. And who was at the helm guiding them thru that process? US Treasury Sect’y Hank Paulson and his colleagues from GS (in- and outside the government). It is a fact that a select few inside and outside the GS-Federal government nexus were successful in bending rules and regulations to the benefit of GS et al. This was not a failure to regulate — the regulators were following their marching orders, which, btw, were crafted over the course of a few years, by the people and firms that were to be regulated. Can it be any clearer? This is not a game-theoretic exercise viz “I’ve got to do it because my competitors will do it if I don’t, and I’ll lose.” This is deliberate bending of the entire regulatory edifice to benefit a few over a short period of time. And, in the mop-up after these actions destroyed the entire system, it is again the insiders who bend the system to ensure they survive. And, perhaps, prosper, since, out of the destruction they’ve wrought, they alone have their people on the inside making sure they benefit as the rules of the game are re-written. They not only know long before anyone else where the bending will occur, but they can influence this process and position themselves ahead of time so they reap the windfall that surely will come after the rules have been changed. This is not profit-maximizing behaviour. It ultimately is destructive of the markets themselves. And the Rule of Law itself. When market participants no longer believe the rules, laws and regulations are being written and enforced by a disinterested Federal government — acting on behalf of a duly elected Legislative and Executive, and answering to a sovereign electorate — it will break down. Then there will be wailing and gnashing of teeth where once there was only whining and moaning. Anyone clicking on the govt links in my reply above has to delete the close paren that was appended to the address. A brilliant commentary. I couldn’t agree more. I would add, that over the long term, this type of nonsense will ultimately bring down a nation. Can you say banana republic?